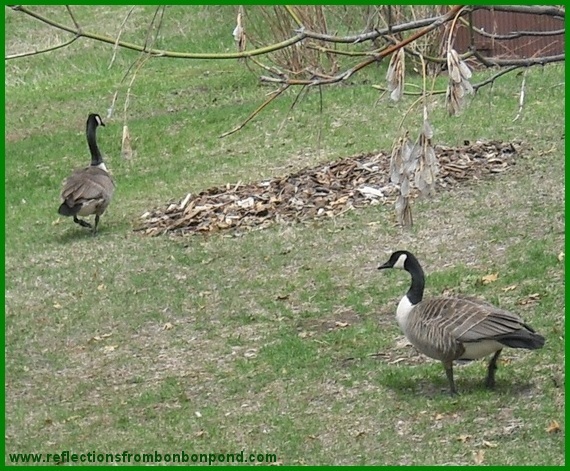 Reflections from Bon Bon Pond: There's a goose on my roof! Never a dull moment around Bon Bon Pond. 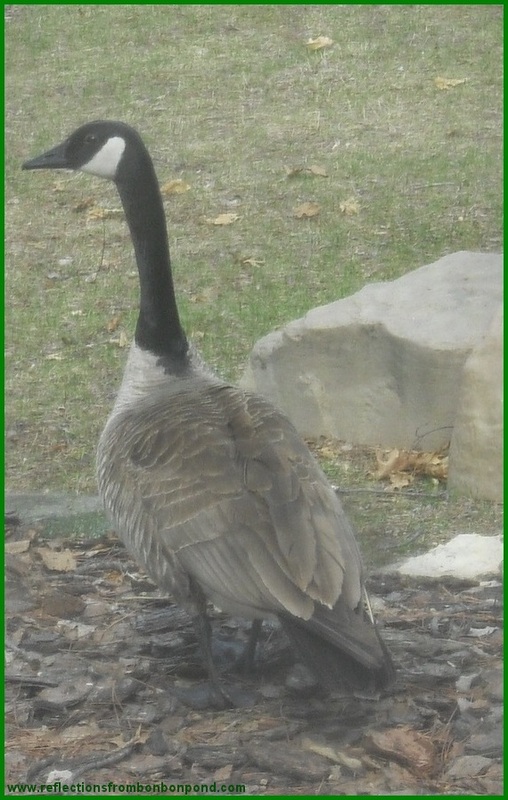 On Sunday afternoon, I peered out my office window and, much to my amazement, spotted a Canada Goose walking thru the front yard. He approached the retaining wall and stopped for several moments, appearing indecisive. Finally, he jumped off the ledge and landed with a thump in the backyard below. “What in the world?”I’m thinking. Then, the picture became clear as a second goose appeared on the scene. It didn’t take long for me to figure out that the second gander was on a mission to chase out the first unfortunate fellow. After ten to fifteen minutes of stalking, gander number two pounced on gander number one, biting him in the derrière and dislodging a fistful of feathers in the process. Poor number one pulled away only to be attacked again. This time, when he gained his freedom he made a mad dash for the open pasture. Hoping, I imagine, to get lost in the weeds. 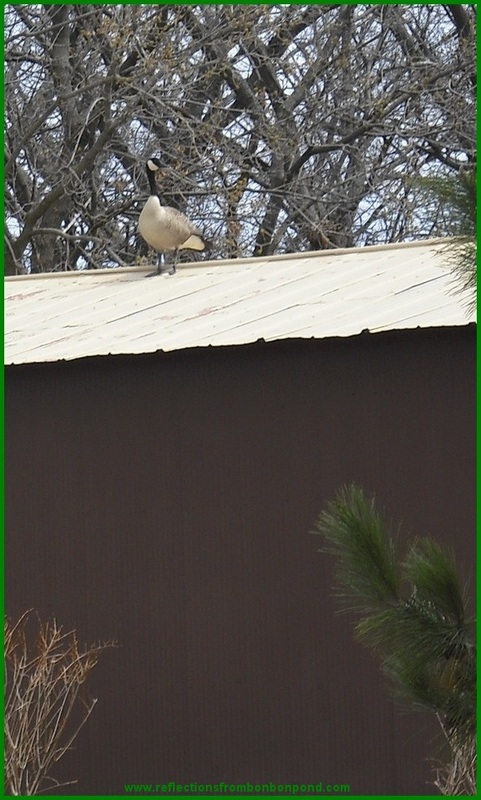 Not to be out-foxed, crabby and crafty number two flew up on the roof of the barn to get a better look. He stayed up there for nearly half an hour, eyes peeled on poor number one. As I had anticipated, poor number one was attempting to backtrack and work his way toward the pond. Why he just didn’t fly back to the water I will never know. ??? Perhaps he thought he could move more stealthily by webbed foot. The poor fellow finally made it back to the pond where the stalking resumed. A part of me wanted to intercede but I know better than to get involved with inborn battles. Number one and his mate appeared briefly yesterday morning to grab some corn before being chased away by crabby number two. Poor babes, I wish them the best. WOW! 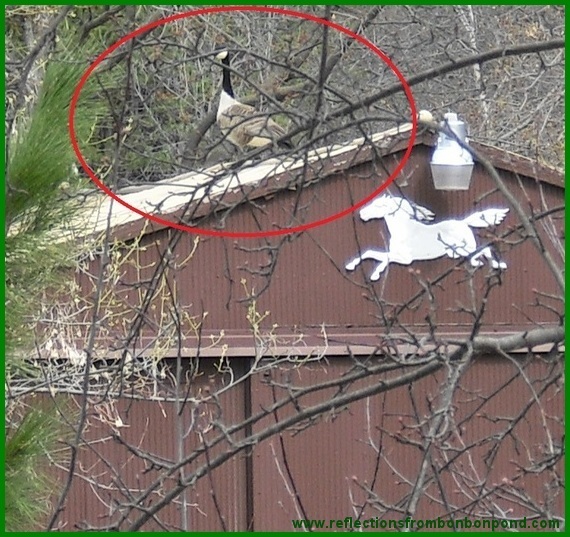 I would love to look out my window and not only see a Canada Goose, BUT on the roof?!? WOW! Very Cool!! Hi chandel314! Yeah, it's a stitch, isn't it! My wildlife constantly keep me entertained. This is certainly the most interesting occurrence since last summer when Buddy the woodchuck took off after a raccoon and rolled him all the way down the hill till he splashed into the water. The last I saw of that poor raccoon was him hightailing it along the shoreline. I Googled woodchuck vs raccoon but nothing really popped. I had no idea the species hated each other so much. I learn something new nearly everyday from the animals.